One Willow Bridge Road is Vail Village's premier club, featuring two, three, and four bedroom mountain-view residences. With state-of-the-art security, high-tech media systems, and renowned Sonnenalp staff, One Willow Bridge provides the highest level of amenities and service. 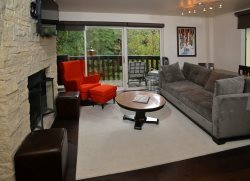 Amenities include daily breakfast and apres ski, saline pool and hot tubs on Gore Creek, valet parking, Sonnenalp fitness center and spa.